As a deep believer in whole body health and wellness, I have been a patient of Chiropractor Dr. Ron Burnett owner of Inner Sun Chiropractic since 1999 (?). I always find it the deepest compliment when someone with whom I have a personal relationship asks me to establish a professional relationship with their businesses. This is certainly true in this case when Dr. Burnett asked me to do a consultation on his medical practice seven years into our personal relationship. 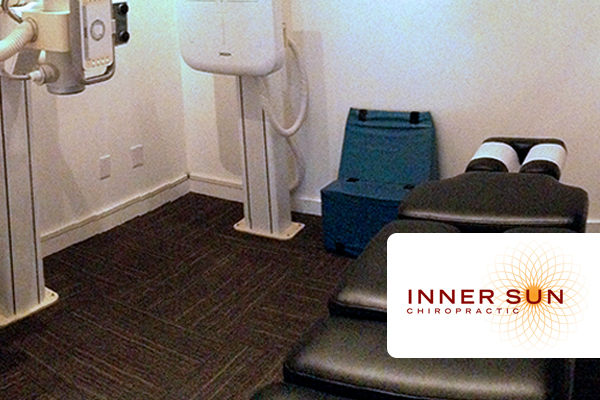 Inner Sun Chiropractic is a successful practice, but Dr. Burnett was noticing a shift when they moved the practice to a new location several years ago. Like all small business owners, Dr. Burnett was looking to grow and increase his business with this move. What was special about this relationship, he also sensed that after the move, something felt “off” and that the energy was no longer flowing in his practice. After an initial Feng Shui consultation we conducted together, I helped him focus on the old energy of the previous business which remained in the space. Energy is much like dust and dirt. It accumulates in a space from years of use and must be periodically cleaned and cleared. After our session together where I cleared this residual energy, Dr. Burnett immediately felt the old energy of the previous business flow out of Inner Sun Chiropractic. This allowed space for the new and healing energy to flow in. In return, there was an immediate impact to the bottom line of the business. Dr. Burnett has me clear the energy grid monthly as employees and clients will continue to leave their individual energetic residue on spaces and places. Our sessions continue to support the transformation of his business and his staff creating a sacred space which feels more open, peaceful and grounded. Most importantly, a space where clients are able to receive the best care possible.